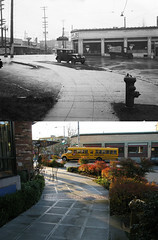 Tradewell Grocery was christened in October 1939, based in Seattle. It was formed mostly from a chain named Eba’s Mutual Markets in Seattle and Eba’s Mutual Piggly Wiggly in other parts of Washington State. This article discusses the stores other than Eba’s itself that were part of that chain. This is the sixth installment of an exploration of Seattle’s chain grocery history, focusing on the predecessors of Tradewell. In early 1927 Carl Gotfried Anderson ran advertisements in Seattle papers announcing that he was opening a new chain of grocery stores. He explained that he was coming from Portland, had sold his chain there and moved to “realize his long desired ambition of living in Seattle.” He traveled a long road to reach Seattle, and he would move on after less than two years. Carl Anderson immigrated from Lyskilde, Sweden with his mother and siblings in 1888 at age 10. They joined his father who had left 7 years prior. Carl grew up in Menominee, Michigan as part of an extended family that stretched across the Menominee River into Marinette, Wisconsin. There Carl apprenticed as a roustabout or laborer at a grocery store, likely owned by his uncle Victor Carlson at 1600 Garfield in Marinette. Eventually Carl worked stock and shipping for a grocery wholesaler, which was probably Carlson Brothers at 1429 11th in Menominee. Carl first appeared in Portland city directories in 1905. He lived with his wife Anna, their daughter Carol and Anna’s father Andrew Anderson in Andrew’s home. Carl and Anna were married in about 1903 and at about the same time their first daughter was born in Michigan. They moved from Michigan in May 1905 and after nine days of enjoying the Lewis & Clark Exposition Carl opened his first grocery store. It was named Multnomah Grocery, located at the intersection of Mississippi and Shaver. It started at 855 and moved across the street to 847 Mississippi to expand into larger quarters. For twenty years it remained his “Store No. 1” after he rebranded the growing chain as C. G. Anderson & Co. Ad for C. G. Anderson & Co from the 1922 yearbook of Portland’s Jefferson High, page 173. By 1915 Carl’s brother Martin had moved from Michigan and joined his firm as a clerk. Their parents and siblings moved to Portland in 1920, with sister Alma working as an accountant, sister Anna becoming a saleswoman and father Charles Robert doing general labor. They all worked for C. G. Anderson & Co. Eventually Martin would act as vice-president and produce buyer. Anderson grew his chain rapidly in the 1920s, from 4 stores in 1922 to 39 in 1926. He then sold the chain in August 1926, reportedly to the firm Clayton & Jaggers. However C&J may have already been a subsidiary of Portland pioneer grocer Allen & Lewis. Regardless, Anderson’s and C&J were merged to form Consolidated Stores with 49 stores in the chain. A&L held Consolidated Stores as a subsidiary until selling it in 1929 to Charles Merrill as one piece of the new MacMarr Stores, which was then merged with Safeway in 1931. MacMarr also included Piggly Wiggly Puget Sound which appeared recently in this blog. After vacationing in Alaska for a month, Anderson took some of his new wealth and moved to Seattle in September 1926. Restless to get back to work he began building a new chain. His first Anderson Food Stores location was an opening day tenant of the Postoffice Market at 3rd and Union in October 1926. 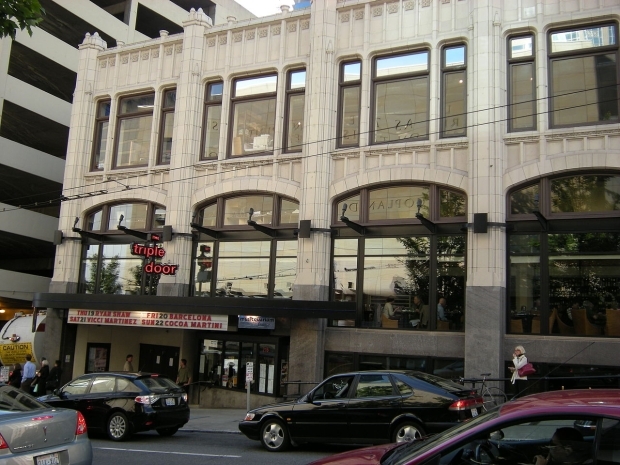 Three months later Anderson was ready to open his second store, which was in Madison Park at 4214 E. Madison. In February 1927 he opened two more, 107 Pike Street and 5407 Ballard Avenue. The brisk pace continued with two new stores in March, three in April, and one each in May, June and July. After only 18 months Anderson sold his chain. But it was a dizzying ride, with a growth rate of one new store per month. He sold 19 stores in August 1928 to a relatively new firm, United Groceries, which had 5 stores of its own. Anderson returned to Portland, where he spent several years with no profession listed in the city directory. By 1933 his brother Martin had a small four-store chain called Cascade Food Stores and another company with one location, Anderson’s Food Stores. In 1934 these were combined as Anderson’s Food Stores with Carl as president and Martin as vice-president and the chain expanded to seven stores. Carl died in 1940 with the chain standing at 11. He was repeatedly a successful entrepreneur and cultivator of capital with a long and broad impact on neighborhoods in Portland. Carl somehow was able to grow his chain amidst the worst of the Great Depression and in direct competition with larger chains. He is deserving of a fuller biography by an Oregon commercial historian. Anderson Food Stores’ 1928 Seattle purchaser, United, was a new firm that grew from a single store over the course of just a few months. Its full name was United Groceries & Markets, sometimes referred to as United Grocers. One early article indicates that United started in April 1927, but it’s not clear what form it took at that point. At the time of merger United had only 5 stores with another about to open. It was led by vice-president and manager Clifford M. Schumacher, treasurer and buyer Harry G. Reynolds, attorney and secretary Frank R. Jeffrey, supervisors Warren L. Murphy and George W. Bradshaw, executive vice president E. R. Errion, assistant secretary and operating manager Lloyd Raab, and president Karl L. Raab. When Schumacher died in 1959 he was 1/3 owner in Money Savers Markets, indicating his lifelong association with groceries. The rest of Money Savers was split between Murphy and Bradshaw, so their business relationship lasted at least three decades. The primary business of Errion as well as Karl and Lloyd Raab’s was investment banking. In November 1928, three months after United acquired Anderson, the firm of Raab Brothers & Errion put 15,000 shares of common stock of United up for sale. Attorney Frank Jeffrey from 10/23/1931 Seattle Times ad for Mutual Groceries. Frank Rumer Jeffrey may have been the best-known of the management team. He was infamous as the attorney who represented the rum running former policeman Roy Olmsted during a headline-grabbing 1926 court case and through appeals until losing at the Supreme Court in 1928. Jeffrey was born in Parkersburg, West Virginia in 1889. He grew up in eastern Washington State’s Yakima Valley, where he worked as a newspaper reporter for a Yakima paper while in high school. He graduated Yakima High in 1907 and then moved back east to Washington, D. C. to study law. He took courses at both Georgetown and The George Washington University, earning an LLB bachelor’s degree from GWU in 1913. While studying he served as secretary to Congressman Wesley L. Jones of Washington State, who was in the House until 1909 and then in the Senate. In 1914 Jeffrey passed the Washington bar and became city attorney of Kennewick, which he continued until he was mustered for World War One in 1917. Jeffrey was a member of the National Guard of Washington, serving in the First Washington Field Artillery. After the United States declared war on Germany, first the standing army and then National Guard were sent to Europe while draftees trained to fight. Jeffrey was an officer, First Lieutenant and second in command of Battery B. Washington’s National Guard was combined with those of several other states into the Army’s new 41st Division. Jeffrey served in the 41st Division, 66th Field Artillery Brigade, 146th Heavy Artillery Regiment, Battery B. The battery was formed from men in Washington State’s Benton and Yakima counties. First Lieutenant Jeffrey gathered with the rest of the men in camp at Walla Walla in August and after meeting other elements of the 41st in South Carolina they prepared to sail at Camp Merritt in New Jersey, finally departing for France in December 1917. 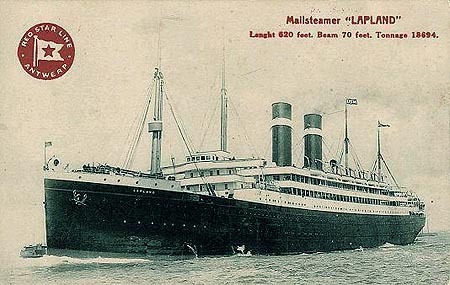 Jeffrey’s 146th Heavy Artillery rode to France on the S. S. Lapland, which is best remembered for rescuing survivors of the sinking of the Titanic. The brigade began training near Bourdeaux, first with guns borrowed from another regiment and then with their own six-inch 155 GPF cannons. Jeffrey was one of five officers in the brigade leading 223 enlisted men in the operation of four cannons and the assortment of tractors and support vehicles needed to move and supply them. The 146th saw their first action in July 1918 at Chateau-Thierry as the Allies attempted to stop successful German advances. They then fought in the Aisne-Marne offensive in July and August and St. Mihiel in August and September. In September they joined the Meuse-Argonne offensive, the same battles that rattled Groceteria’s Alvin Monson. Jeffrey was promoted to Captain in September 1918 and “cited for gallantry” for combat in October. The 146th Regiment shelled heavily in battles through early November to support the 1st Division’s push towards Germany. After the war came to a close, Jeffrey was promoted again to Major. After returning to the United States in July 1919, Frank Jeffrey became the first state commander of the American Legion. He also entered a legal partnership with Kennewick lawyer Mark M. Moulton. Both of them were politically well-connected. Moulton was elected to serve in the 1921 Washington State House of Representatives, where he served three terms and again in 1939. Also in 1921, Jeffrey leveraged his relationship with Senator Jones to secure the position of United States Attorney for the Washington State Eastern District Court in a year when the deluge of patronage requests was newsworthy. He served one term until 1926, when he moved to Seattle and opened a private law practice. By July 1929 after less than a year of growth and acquisition United had 18 stores in Seattle and stores in ten other cities: Renton, Issaquah, Snoqualmie, Kent, Auburn, Lake Burien, Port Orchard, Poulsbo, Port Townsend and Ketchikan, Alaska. Headquarters were at 110 West Roy Street. In March 1930 they added their 37th store, in Port Angeles. Seattle was static, but regionally they had expanded to Bellevue, Everett, Mount Vernon, Sedro Woolley, Burlington, Anacortes, and Sequim. Store 38 opened in Lynden, Whatcom County and by October there were 42 stores. With the onset of the Great Depression, Americans were pushed to discount grocers to save money. This meant that chains like United Groceries and its rival Safeway won an even larger share of grocery sales. With their cash-only policy they didn’t have the burden of customer debt and were less exposed to the difficulties of obtaining bank loans for operating capital. But as the economic crisis lengthened month after month, only the soundest businesses survived. In the Washington State, Jones Piggly Wiggly was perhaps the first major chain to falter in late 1930. After Jones declared bankruptcy, United purchased 40 Piggly Wiggly stores across the state from receivers on October 20, 1930. The purchase was mostly on I-O-U “note” loans, under the assumption that United could make enough profit to pay them off within a year. $35,000 was paid upfront, $111,000 on loan. Only $48,000 of that was ever paid. Furthermore, the purchase was made by United Groceries’ parent company, United Foods. UF was the food distribution arm of the grocery business. UF then transferred the assets but not the debt of the stores down to UG. The deal was found fraudulent in court, and both UF and UG were pushed into bankruptcy of their own in late 1932. United Grocers exited the PW purchase-on-loan with 82 stores. By February 1931 a handful of stores had closed, with 76 stores remaining. In May they had around 60 stores. In August they dropped to 42 stores. Probably recognizing that bankruptcy was imminent, a new corporation Mutual Grocers was formed by Frank Jeffrey and Arthur H. Jones to purchase United Groceries’ assets in August 1931. Mutual also purchased the 18-store Pay-‘N-Save chain run by Jones, as described in the article about Jones and Piggly Wiggly. Jones took over management of operations while Jeffrey became president and took over the business side of things. KML for Anderson Food Stores in 1927 and Mutual Markets in 1937. Just five months after Mutual Markets was formed, it was merged with another Seattle chain in 1932: Eba Grocery. Started as a single Pike Place Market store by Herman Eba in 1908, Eba’s was grown into a chain by his son Earl. By the time of the merger Eba had ten stores, bringing the full chain to 52 stores. Earl Eba was selected to manage the new venture. Frank Jeffrey used his extra free time for a return to political life. In 1932 he entered candidacy for Washington State Governor, although his campaign never got serious. In 1934 he launched another campaign, this time for for United States Senate. He gathered some energy but still was not able to overcome rivals in his own party. The complete story of Eba’s and its collapse into ownership by distributor Pacific Gamble Robinson is the topic of the next article in this series. Special thanks to the Scott Daniels of the Oregon Historical Society for providing copies of three Oregonian articles about Carl Anderson. This is a longshot question. First, I’ll start with a few sentences of background. In the late 1960s, my Mom regularly shopped at the Tradewell grocery store in Port Angeles, Washington. During a recent conversation with her about “the old days,” I told her I would try to find the recipe (used by the store’s bakery) to make the sesame egg bread that we had loved so much. This bread with its distinctive yellow color had an incredible texture and taste. We have not found any bread since that is comparable in flavor. Can you provide any leads as to where I might find the store’s recipe for this specific product? Any help would be appreciated. Cary, I don’t have the recipe for Egg Sesame bread, but it was my favorite growing up in Bellevue, Washington late 1950s to late 1960s. I would love to get the recipe, too. I think it might have been similar to French brioche bread now popular.